The next speaker in our student seminar series will be Scott Audette. Scott will be giving a talk titled “Mechanical properties of aerospace composite parts made from stitched multilayer 3D carbon fibre preforms”. The abstract of the talk is given below. Hope to see you all there! Producing composite parts using low-cost processes such as resin transfer moulding (RTM) has received much interest in the aerospace industry. RTM manufactured components require near net shape preforms which closely fit mould cavities. To reduce labour costs associated with composite production, automated preforming processes must be utilized. However, obtaining reproducible high quality preforms is required for manufacturing consistent high quality parts. Stitched multilayer 3D non crimp fabric preforms are well suited for automation and an investigation into quality and performance of components manufactured from these preforms is required. This work provides an initial evaluation of quality and mechanical properties of components made from stitched multilayer 3D non crimp fabric preforms using RTM. Similar sized flat plates of varying fibre volume fractions were manufactured to evaluate flexural modulus and strength, short beam strength and drop weight impact resistance of the material. Also, integral reinforced panels (IRPs) featuring a reinforcing section joined to a flat plate of varying laminating sequences were manufactured to evaluate debonding strength between sections. Optical microscopy was performed on component samples to determine quality based on void content and was found to be within acceptable limits for production composites. Flexural modulus was comparable to theoretical expected values, however flexural strength was limited by the presence of transverse stitches. Short beam strength results showed high consistency between specimens and performed well against comparable data. Impact specimens showed consistency among specimens, with reasonable damage resistance. Determining debonding strength proved difficult as different failure modes were observed between IRPs, however, initial baseline values were acquired. 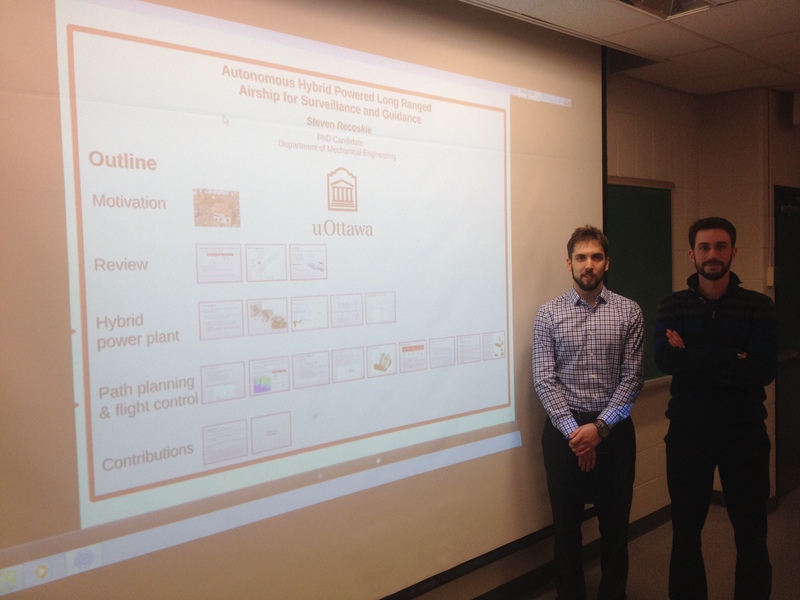 Yesterday, Yu Hu gave his thesis seminar (in the picture below, Yu beside his supervisor, Dr. Dan Necsulescu). The next speaker in our student seminar series will be Yu Hu. Yu will be giving a talk titled “Human friendly robots”. In this project, a novel human friendly mobile robot navigation controller is investigated. By applying this controller, the mobile robot is able to work in a complicated environment with several humans and other obstacles avoiding them before a collision happens. This robot will have a preference in avoiding humans over other obstacles keeping human safety as its first consideration. To achieve this goal, three problems have to be solved. The first one is the robot should be able to “see” the environment and distinguish the human and the obstacles. The functions of human sensor and sonar sensor are presented. A new sensor fusion method for combining the information collected by these two kinds of sensors based on Dempster-Shafer evidence theory is also proposed. By using the sensor fusion method, the robot will have a better view of human. The second problem is the robot has to know how to avoid collision. A new navigation algorithm, based on an improved velocity potential field method, is then described. The way of calculating the distances of avoidance based on different kinds of obstacles is presented as well. The last problem is how to make the mobile robot put human as its first priority when avoiding collision. A summary of the methods which are used to protect human is mentioned. According to the simulation and the experimental results, the new mobile robot navigation controller successfully leaded the robot avoid collisions in complicated situations and always put human safety as its first consideration. Yesterday, Christina Vanderwel and Steven Recoskie gave their thesis seminars (in the pictures below, Christina and Steven with their supervisors, Drs. Tavoularis and Lanteigne). The next speaker in our student seminar series will be Steven Recoskie. Steven will be giving a talk titled “Autonomous, hybrid powered, long ranged airship for surveillance and guidance ”. The seminar of the talk is given below. Hope to see you all there! With devastating natural disasters on the rise, new technologies are needed to improve search and rescue capabilities. Unmanned aerial vehicles are the ideal candidates for surveying disaster-stricken areas and searching for survivors, however, their range and endurance is limited. The objective of this research was to investigate alternative propulsion methods and flight planning techniques for increasing the flight endurance of unmanned airships. Airship design methodologies were reviewed leading to the development and experimental testing of two hybrid fuel-electric power plants. The mechanical and electrical power was measured and we were able to demonstrate that the proposed system offered a 600% increase in energy density when compared to purely electric systems. Based on this vehicle configuration, a comprehensive multi-objective cost function was developed for flight path optimization using a wavefront expansion path planner. Paths were simulated in large 3D environments incorporating variable wind vector fields generated from computational fluid dynamic analysis on digital elevations maps. Combined with a full dynamic model of the airship and two different control strategies, we have been able to show that the paths generated by the planner lead to significant improvements in path feasibility and energy optimality when compared to using constant wind fields. The next speaker in our student seminar series will be Christina Vanderwel. 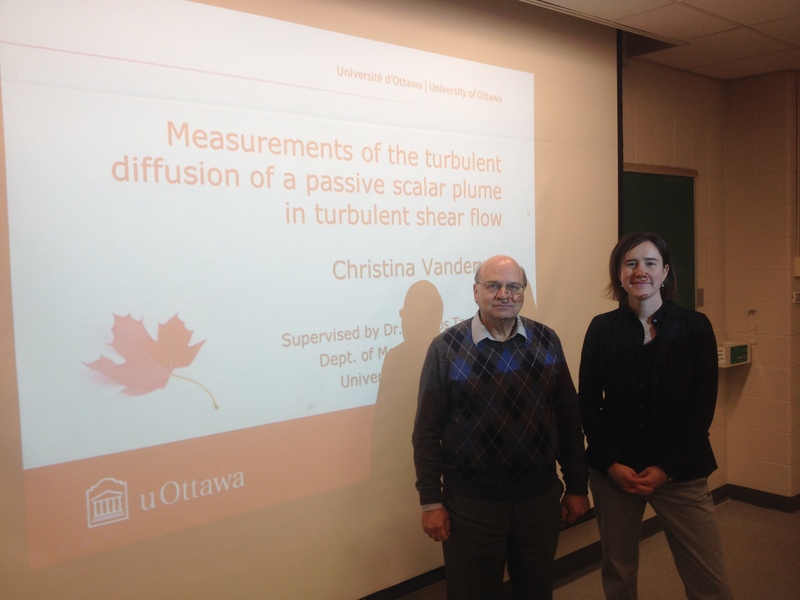 Christina will be giving a talk titled “Measurements of the turbulent dispersion of a passive scalar plume in turbulent shear flow”. The dispersion of pollutants in oceanic and atmospheric flows is of significant interest in environmental applications, however, dispersion in such highly turbulent flows is still not well understood. The objective of this work is to further the understanding of turbulent dispersion by experimentally studying the turbulent dispersion of a plume of dye released in turbulent shear flow generated in the controlled environment of a laboratory water tunnel. Maps of the turbulent velocity and dye concentration were measured simultaneously using stereoscopic particle image velocimetry and planar laser-induced fluorescence. The results were compared with fundamental models of absolute and relative turbulent dispersion and, for the first time in an experimental flow, all components of the eddy diffusivity tensor were directly measured. We were also able to demonstrate that coherent vortices present in the turbulence are directly correlated with turbulent transport and are a dominant mechanism of the turbulent dispersion. 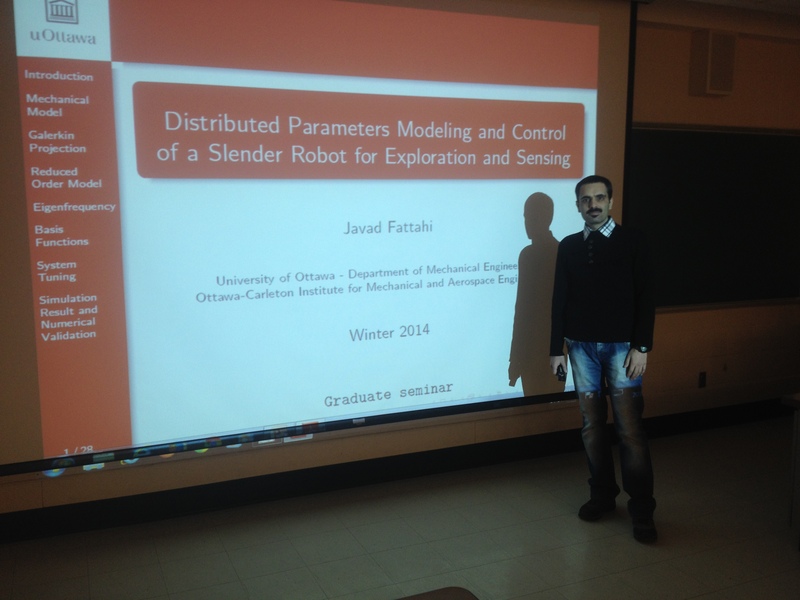 Yesterday, Javad Fattahi gave his thesis seminar (in the picture below, Javad beside his seminar’s opening slide).